In the 19th century, Belgian priest Damien de Veuster risked his life helping leprosy patients in Hawaii, until he eventually caught the disease and died. The Vatican has credited the missionary, shown here in 1889, with performing two miracles -- one of which happened a century after he died. The church announced Saturday that it would declare him a saint in October. 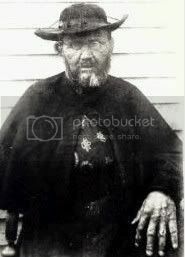 Born Joseph de Veuster in 1840, he took the name Damien and went to Hawaii in 1864 to join other missionaries of the Congregation of the Sacred Hearts of Jesus and Mary. Nine years later, he began ministering to leprosy patients on the remote Kalaupapa peninsula of Molokai island, where some 8,000 people had been banished amid an epidemic in Hawaii in the 1850s. The priest eventually contracted the disease, also known as Hansen's disease, and died in 1889 at age 49. "He went there (to Hawaii) knowing that he could never return," The Rev. Alfred Bell, who spearheaded Damien's canonization cause, told Vatican Radio. "He suffered a lot, but he stayed." De Veuster was beatified — a step toward sainthood — in 1995 by Pope John Paul II. Is that dude already dead in that picture???? Hansen's disease. I dunno, but that makes me picture someone having to sing Mm-Bop until they expire.